Every mound has its own chapter to tell in the unfolding story of the human past. With construction spanning many centuries, the earthworks, when carefully investigated by archeologists, reveal how people lived throughout the millennia. But opportunities to discover more about these mounds and their builders disappear daily as erosion, farming, urban development, and looting continue to degrade these sites. Untold numbers of the old monuments have already been lost, and secrets of our nation's past have vanished with them. Those mounds that remain stand as a testament to the vitality, diversity, and creativity of their makers, who developed the complex societies of long ago. It is up to us to protect the mounds that are left, so that we and future generations may continue to experience the wonder of these dramatic memorials of ancient times. Public Law 103-433, passed by Congress and signed into law by President Clinton in October 1994, directs the Secretary of the Interior to undertake a comprehensive program of studies on heritage in the "Lower Mississippi Delta." The diverse region is defined in the legislation as the Mississippi River lowlands and adjacent hill country in seven states - Illinois, Missouri, Kentucky, Tennessee, Arkansas, Louisiana, and Mississippi. The primary goals of this legislation are to recommend methods for preserving and interpreting the heritage of the region and to enhance economic development through cultural tourism. In response to this mandate and in cooperation with federal and state agencies, the Indian Mounds of Mississippi brochure was created and published in 1999 to help promote some of the area's rich, yet often overlooked and little-appreciated heritage sites. This travel itinerary is a reproduction of that brochure. The Natchez Trace Parkway, a unit of the National Park Service, commemorates a historic route used by American Indians, pioneer settlers, traders, and soldiers during the late 18th and early 19th centuries. 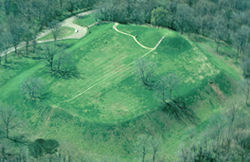 Extending 450 miles from Natchez, Mississippi, to Nashville, Tennessee, the Parkway incorporates numerous visitor stops of historic, natural, and archeological interest, including five of the mound sites highlighted herein-- Bear Creek, Pharr, Bynum, Boyd, and Emerald. The Tupelo Visitor Center interprets the archeology and history of the Trace. All sites listed in this travel itinerary are protected by law. Please be aware that unauthorized digging, removal of artifacts or human remains, or other disturbance of the mounds and surrounding grounds are strictly prohibited on state and federal lands by the following statues, as applicable: the Antiquities Law of Mississippi, the federal Archaeological Resources Protection Act (ARPA), and the federal Native American Graves and Repatriation Act (NAGPRA). NAGPRA addresses American Indian concerns about the desecration of their human remains and the ownership of cultural items. The Act emphasizes the importance of treating human remains and cultural items with dignity and respect. Violators of NAGPRA and these other statues are subject to prosecution. For more information about federal laws, regulations and standards related to cultural resources see: http://www.nps.gov/history/linklaws.htm.